I am totally discriminatory in my pricing for many things. If a poor, sincere college kid asks for some advice, I won�t charge him a dime. But if a get a call from a large, multi-national conglomerate wanting the same thing, I�ll charge them enough to fund my high-class diet of chips and salsa for like 182 years. This occurred to me when I got a call from a consulting client last week. They wanted me to do a small project for them over the next month. Very flattering. The thing is, I started consulting for them while I was back in school, and even back then I had been working at a lower consulting rate than I would normally charge. Why? Because I wanted to get my foot in the door, the people are great, the work is interesting, and it’s for a good cause. And consulting for this group opens many more doors. I had mentioned that I wanted to run some logistical questions by the head guy, so a few days ago, we chatted and ended up having an impromptu negotiation. I wanted to settle my new consulting rate before I started this project, and I explained that even my old rate been undermarket (and why I deserved more, etc). He listened patiently. And then he calmly said no. DAMNIT!!! But then I took a step back and realized it wasn�t so bad. Either that or this whole article is just a huge rationalization about getting shot down in the negotiation. Fair points. I told him I�d think about it and, within a couple of hours, decided to take it at my old rate. But here�s where it got interesting for me: I was chatting about it with a few friends, and they all told me that I should have walked away. They said that the rate was �below� me. What the hell? I think this is where a lot of people differ. When pride gets in the way, everybody loses. These friends were basically saying that I should tell the client to pay me my normal rate or take a hike�with no regard for the long-term potential. Good business doesn’t work like that. If you�re only concerned about the short-term money, you are a fool (and greedy). If you think negotiations are zero-sum, you are a fool. And if you don�t realize that at our age, experience is more important than money, you are a fool. The question is this: Do you want to feel good about walking away from a negotiation that didn�t go exactly 100% your way? Or do you want to do interesting work that will open more doors over the long term? �But Ramit,� you might say if you are stupid and completely miss the entire point of this article, �I don�t have any �consulting gigs.� This whole article is irrelevant for me!� I guess it is, for you. But for everyone else, it doesn�t matter whether it�s a consulting gig or a job negotiation or the chance to give a talk at a little girls elementary school. The example doesn�t matter. Well said, sir. You�re right: There are definitely places where you negotiate the hell out of a deal and walk away being fully rewarded for your skills. When this happens to me, I feel GREAT. But more often, I feel really happy to take an opportunity that will open more doors down the road. The value of these opportunities is incredible�imagine doing cool work, knowing great people who can give you advice and connections when you need them, and improving your skillset. My point is, think long-term. Think about what you can learn and what you can do for the client/job/school. My friend, for example, is interviewing at a new job where she�ll be paid $10,000-$15,000 less than she�s currently making. The hiring manager was worried at first. What he didn�t realize is that my friend is smart. $15k sounds like a lot, but at this level, it�s not really that much. What is valuable are great contacts and opportunity-generating opportunities. She knows very well that a $15k hit isn�t beneath her. And if you think it�s beneath you, you�re probably wrong. Trust me�when it really is beneath you, you won�t have to make that call. Your gold-cane-carrying butler will tell your personal assistant to tell your trophy wife to tell you. Ah, what a simple life I will have. Now there are some legitimate reasons for walking away from a deal, even at this point in our lives. If someone is trying to take advantage of you, there�s nothing wrong with walking away, and if your gut says to go, it�s probably right. For example, until recently I never understood why street-side merchants would ever refuse lowball offers that some tourists made; after all, the merchants almost always profit (just not as much as they would want). I finally realized it when I started a t-shirt company: Everybody I knew tried to get deals off of me (Anton, you jackass). At a certain point, even if you would have profit a little bit, you just say �no way.� Someone else will come with a fairer price and you�ll get paid, even if you lose a small amount here and there from lowballers. In other words, if you cede to every demand, you�ll be desperately selling to the lowest common denominator at the lowest price. That�s no fun. But too many people walk away from opportunities for dumb reasons that mostly involve pride. �They won�t pay me enough!� or �They didn�t do X for me.� All of this, without considering the long-term doors that we�re closing. For now, while we�re young and learning, I think we should be actively taking opportunities to work with organizations that give us these opportunities. The money�s important, but it�s not the only thing. CEOs don’t just magically flip a switch and start wearing a fancy suit one day, directing their staff to do this and that. It starts earlier. For that CEO, it probably started when he took a paper route in junior high, or started a Web site in high school, or designed an interesting product in college. It started by knowing how to get in touch with the right people and learning–through lots of experience and failure–that senior executives are just people. They’re regular people who started their path to being extraordinary by taking small steps. First of all, can I just say how simultaneously cool and absurd it is to quote myself. I love it!!! Anyway, this idea of thinking of long-term opportunities�not pride�seems like a perfect application of how to avoid The Shrug Effect. It starts right now, when you�re thinking about your first job, or your summer internship, or that volunteer opportunity. Try to actively seek out opportunities that generate more opportunities�and stop blocking yourself with pride or worries about how much money you�re going to make. While I agree that considering the long term is incredibly important, and appreciate that you’ve mentioned times where walking away is the more profitable choice, I’ve a hard time agreeing with the decision to stay with a non-budging client in a reasonable negotiation. Ideally, your client would acknowledge that your services are worth more now than they once were specifically BECAUSE of the experience the title of this post alludes to, and should be willing to consider offering a higher investment into said experience. I don’t know you or your client; it’s impossible for me to know how much benefit is gained by maintaining the business relationship. Word of mouth is always best – which long term clients and the free help you offer students should give you plenty. Meanwhile having time for larger, high paying clients is incredibly valuable. It’s a balance those of us who offer our own time as a service have to maintain. Essentially, one’s service fee isn’t always the doorman to the ego. It’s not always a short-term issue. Experience is an investment which gains value over time. A good, long-term client should understand, appreciate and be willing to pay more to hold on to that investment. Well written, and good point. We’re close in age, and you have much more insight. My first job right now pays $15K less than a comparable job — but the reputation, and a good recomendation of the president of our company can probably get my any job in my field in a few years. I agree with you, Ramit, that it’s important to gauge the long-term effects of the business you take on. And for that reason, it’s important to adjust your rate so as to meet the needs of the particular situation. Where I disagree is your argument for rate adjustments. With the logic you provided I wouldn’t have hired you at a significantly increased rate, either. As someone who charges 250% (or more) what I charged the day I opened up shop 3.5 years ago (at 20), and who has never capitulated on rate, I say there are reasons to raise your rate that clients will accept and appreciate. Rate is related to a few things, some of which are worth noting. The things client DON’T want to hear about are overhead or improved-reputation–that’s a reason for a few percent increase year to year, but nothing more. Reputation is a selling POINT not a COST. The only time reputation is a cost for the client is when your reputation is going to make it easier to sway some decision later (like helping people to listen when you’re consulting or to accept your report because of your stamp of authority). What you want to stress are the real reasons: efficiency & quality gained. I can work much faster than I did 3.5 years ago and I can get much more done. My advice is better, my work product more thorough & understandable. Have I had fortune 500 clients, spoken for large audiences, developed a reputation, taken on employees? Well, sure… but who cares? That just means I should have greater efficiencies in producing my work product and making more from less. So now you understand my argument for rate increases. And if you do well presenting this then I think you’ll get hired for what you ask for. I was kind of shocked at first how well that worked, but it does. Do they have the time to argue over cost and go through this process of soliciting another vendor? Are they taking other bids already? Have your positioned your services so they are (or at least appear) unique? Do you have an existing relationship with them so that they’re going to save money by not having more people involved in getting you up to speed? I didn’t mean to make this into a rant, but I think there’s a reason to charge what we do. You’re 100% right that it’s important to build relationships when you’re starting out…but I’d hate to see people fall into the trap of thinking that they really will meet the most amazing person at this company. Fact is: building relationships is a very conscious effort and most of the time the people that seem like gold won’t be golden. Take what you can get but don’t devalue yourself in the process. And learn what I learned: it may not seem like you’re worth 50 or 100/hr, but if you’re only pulling in 3 billable hours in a week then maybe there’s a reason to charge so much. The good news is that by the time you realize you’re worth what you’re charging you’ll have a lot more billable time. I can’t agree more completely. I’m 25 now and have probably made more stupid decisions over the short term money rather than the long term gain. In short, I wish I had read this very post 4-5 years ago. It really would have saved me some bad employer experiences and some (relatively) wasted time. In any case, you live and learn. Great point. It’s silly to walk away from long-term payoff for short-term pride. Opening new doors is far more important. HOWEVER. The very second that it becomes clear that those new doors aren’t going to open, you have to walk away, or risk devaluing your services. Far better to spend your time developing contacts that know what you’re worth and are willing to pay. I could not agree with this more, I might also add “that you never know WHO you know” It was a Friday night at 8pm, I wanted to go out and blow the steam from the week off when a client called with some problems they needed fixed ASAP. Now, 8pm on a Friday night are hardly business hours, and I considered putting it off until Saturday, but being the good business man that I am 😉 I dropped my plans and went out to this gentleman�s house to take care of his computer problem. Long story short, it turns out this guy was the Senior Vice President of a HUGE insurance company and is now a venture capitalist who has helped some pretty well known companies get off their feet. We ended up talking about business related topics for more then 3 hours and it looking like he is going to help put a few of my ideas in the spotlight. Opportunities arise when you least expect them, most people would have told this guy to call back during business hours, opportunity arises when you least expect it. Thanks for all the great advise. As a senior in college, this site helps alot. This is good stuff. As a freelance media creative, I find that the more I mature in my own market the more I can supplant intangible value/worth with cash. And the more leverage I have to decide the balance. This freedom is hard won. Downward pressure on rates, however, seems logarithmic. The effect is also communal. Witness your client’s comparison of your rate to your collegue’s rates. You have an obligation to them to help create the culture of value and to try to have the client appreciate, desire, and reward the good (and worthy). You get what you pay for. I might start working at my zoo pro bono, or maybe even minimum wage to get some great experience as well as contacts. I can completely relate to this post. I just went through a similar negotion process and am starting a new job on Monday. I had to consider all the points you mentioned above and decide if the new job would be a better opportunity in the long run than the job I have now. Currently, (well, until Friday) I have a prestigious job with a pharmaceutical company traveling around the world, spending evenings eating at the nicest restaurants we can find. It was a hard decision, but I decided that giving up that “prestige” for a job in the software industry (an industry I have a greater passion for) was worth it to me. I had to force myself to forget the short term and act in a way that would be better for me in the long term. When you’re too focused on the present, decisions like that seem like big sacrifices. However, if you’re wise and consider the long term effects, you realize it’s not a sacrifice at all, but an opportunity you didn’t pass up. I don’t get it. I think you may be right about rationalization. Sounds to me like it went 0% your way. Are you thinking of this gig as a kind of career fair you pay to attend? Why’d you bother with college if you end up making the EXACT SAME amount as in high school? (Even if college was free, there’s the opportunity cost…) You talk about the interesting experiences and opportunities the gig brings, but you bring more interesting experiences and opportunities to them than you did in high school, and they should pay for that. If they don’t care about those things, then you should walk away not out of pride but because they simply can’t accept your incremental value. That’s why it’s “below” you. My young friend, welcome to the world of being overqualified. Interesting article, Ramit. One question I have for that guy is what business is it of his if you do the work from home or any where else? Why should that have anything to do with the project. He knows your work and knows what you are capable of. It seems like they could have at least met you half way. Anyway, it was a great article and I wish you the best. Something tells me that you will never be without! Sometimes, one has to walk away from existing clients if you have “outgrown” them in my opinion and go search for other opportunities. The world is such a large place, dont be trapped into thinking that your existing job is the only place with long term benefits. Peter, I’ve consulted for them since college (maybe a year ago), not since high school. That would be a long time to be at the same level. I understand your point, I just wonder what greater possibilities you are opening for the future by accepting the low wage now. I mean, if it were more contacts or opportunities, that would be something worthwhile. However, if you are merely reserving the option to continue working below your usual rate in the future, then this client isn’t really worth your time. Especially now that you’ve essentially permanently given up the edge in any future price negotiations. Despite that, I’d probably take the job if I didn’t have anything else pressing at the moment. I’d do it for goodwill and short term cash, but that client would be first on the chopping block when it came time to prioritize. Consultants can and should fire underperforming clients. Experience and money are equally important but both are overrated in real world. 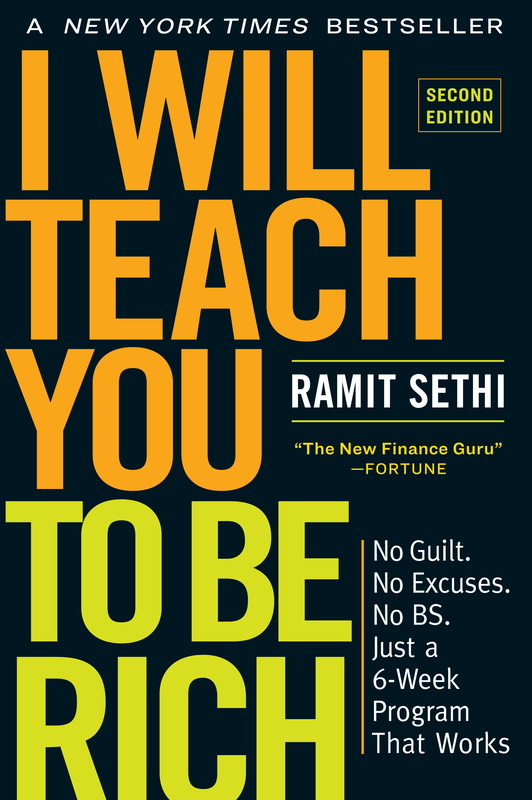 Ramit’s title makes perfect sense for someone who knows about one’s long term goals or at least has a blue print of it. But 99% of fresh graduates and students need another 15-20 years to discover these long term goals or to discover what they really love to do in life. In such cases, planning is overrated in the real world and there is no way to estimate the marginal benefits of long term opportnuties in the line of interest over short term for experience or money. Thus being said, if one does not have a blue print of life, something is always better than nothing and it is one of the way to DISCOVER this love-to-do-things in life. On the other hand, today’s world there are a few more than finite number of opportnuties for fresh graduates and students to make a living. If these students do not have any idea of long-term goals, it also makes perfect sense to walk away from a low paying offer to something that pays better, as opportnuties do exist for them. Money is as important as experience. I started out business often lowering rates and fees to “get in the door.” I *never* do this any more. Why? Customers will always expect that same rate from you in the future, and when you ask to raise your rates, they’ll assume they can get the lower rates elsewhere. Personally, I would have, at the very least, negotiated for non-financial perks. It could have been something as minor as a lunch invite with one of THEIR bigger clients (basically their personal endorsement). This is an interesting article. Essentially you advocate an attitude toward job acceptance that I have been debating with friends of mine. That sometimes you should take the lower paying job because of the contacts or the skills you will learn. I’ve heard from many successful people that you should take a job for the skills it will teach you rather than the pay you will receive. Because the goal, if you want to be rich, is not to work for money but put those skills you learn to task in making your money work for you. Great post! Glad I found your blog! This is not negotiating. You don’t walk away from a deal because they didn’t accept your first offer. The only reason to walk away is if you can make more money elsewhere. You’re supposed to counter with a lower offer that is still above the original price. If they really want to keep you around they would have given you at the very minimum a token raise. All you got was used!